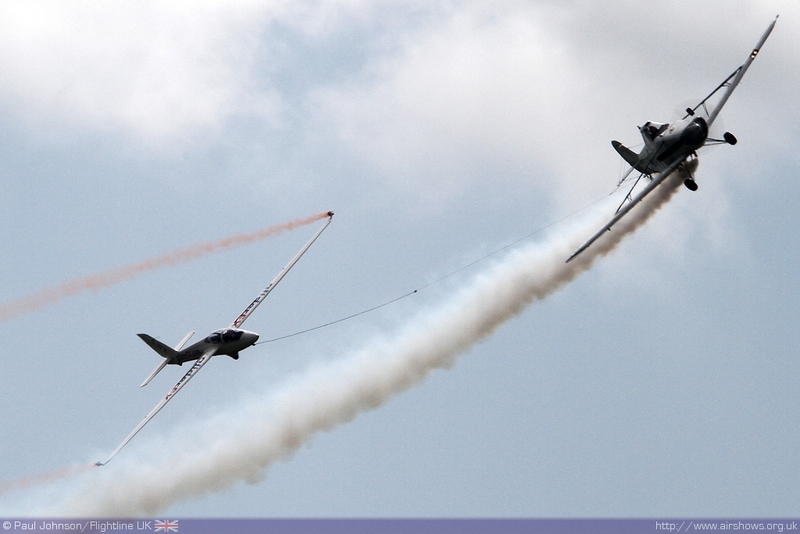 If there is one other European country where airshows are as popular as the UK, it's the Netherlands. 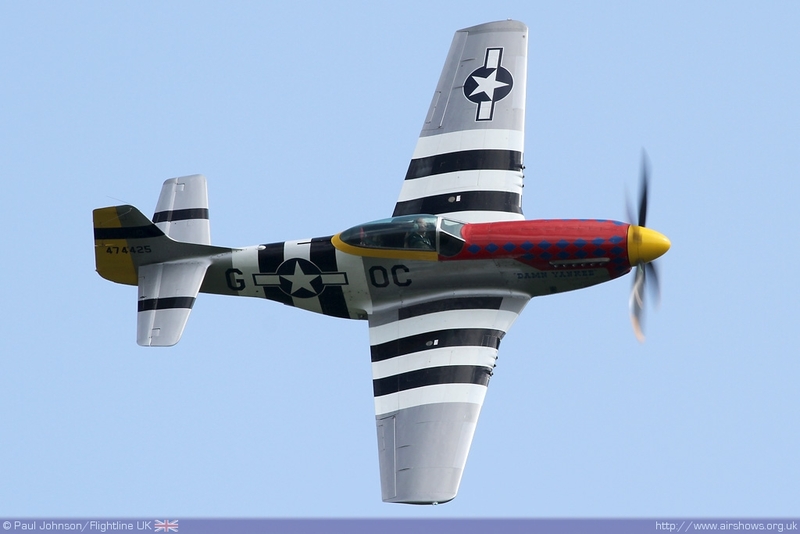 The first of their major civilian airshows of the year takes place at Volkel in the South-Eastern Netherlands. 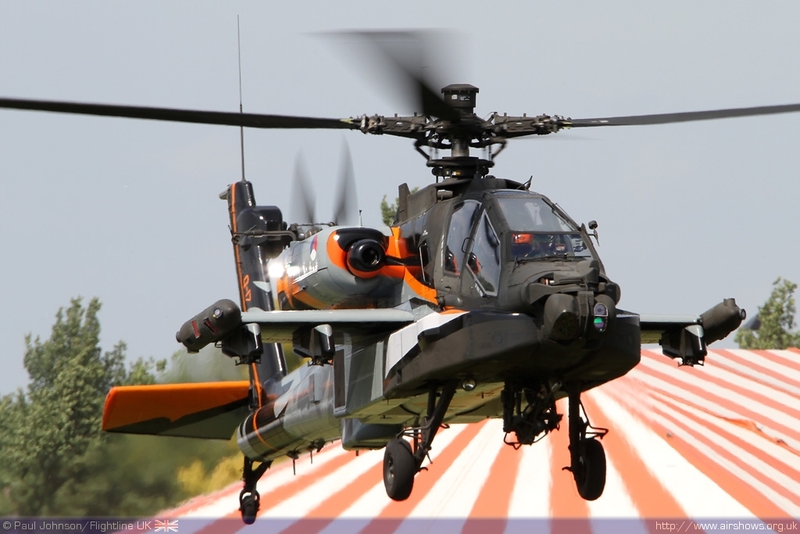 While there is a massive military airbase at Volkel, the show is in fact part of a town show and takes place about 1 mile off the extended centreline of the base's main runway just outside the main town. 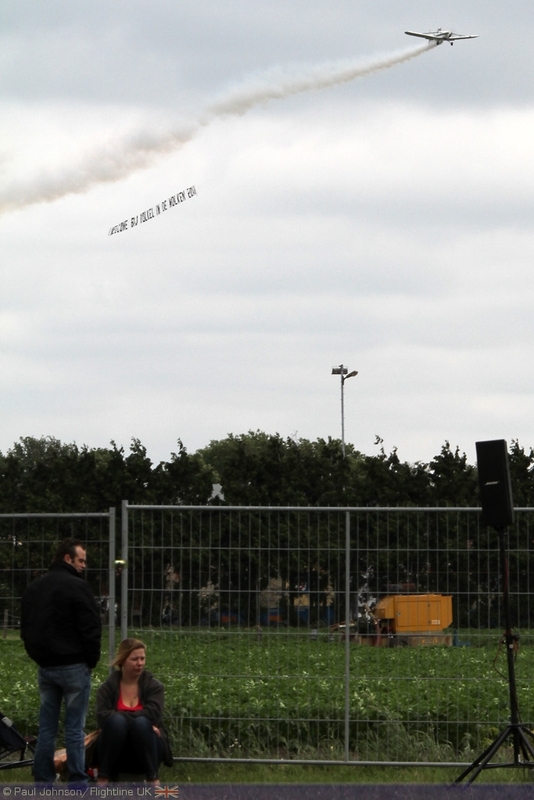 In fact, the display line is over farmers fields with the main show held within meadows known as Volkel Park. On the ground, there is an eclectic mix of attractions from music to custom cars and bikes! 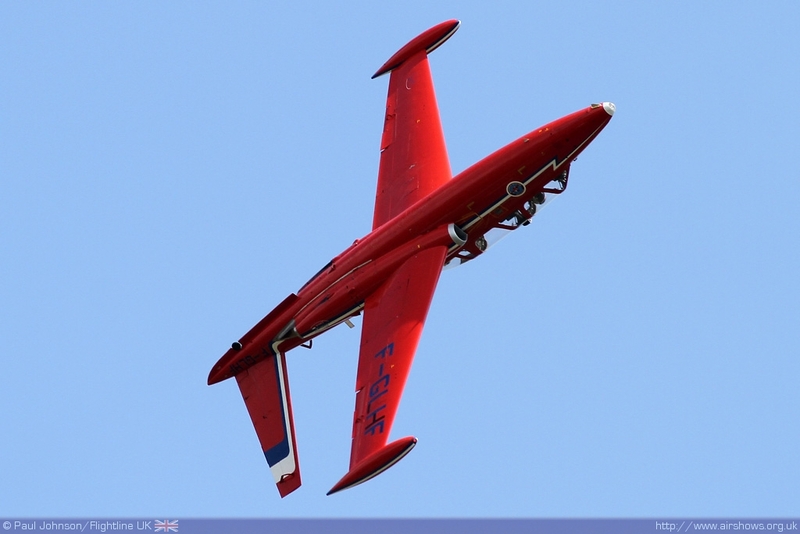 The flying displays are an unusual mix for the UK-based spectator with some very “different” displays interspersing some of the best displays from across Europe, many of which we'll probably never get to see in the UK. 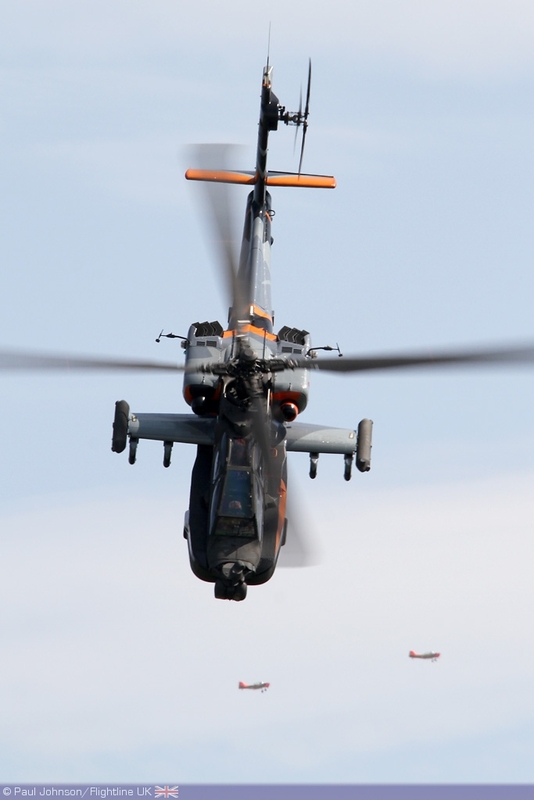 With the show running for five hours, it is one of the biggest civilian organised events in the Netherlands and is popular with the public and enthusiast alike, with the latter appearing at the show as well as all along the roads between the town and airbase. 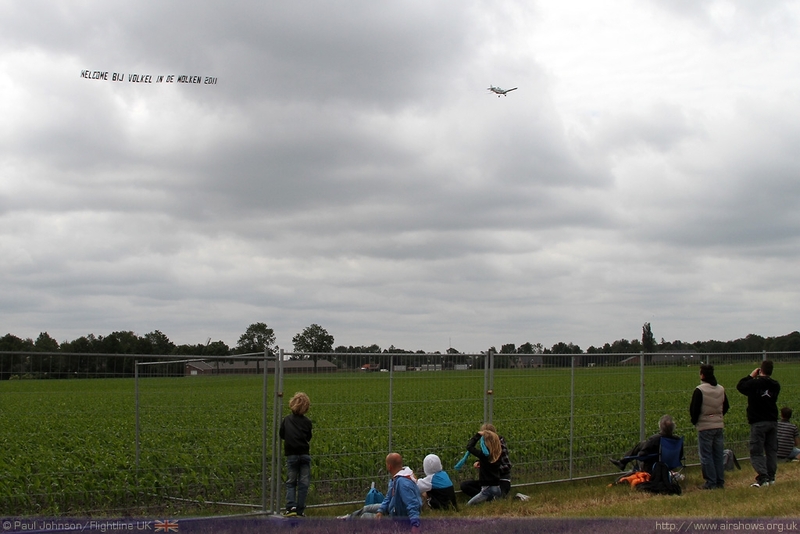 The Dutch love airshows! That was more than clear on the short drive between Volkel Air Base and the show site with huge numbers of cars parked on the verges! 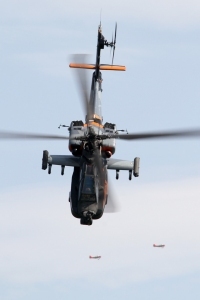 Even more people were crammed into the show site which for the first time in a couple of years or so boasted static displays from military helicopters as well as the usual medical and police aircraft. 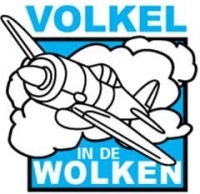 Volkel is an unusual event, it is very like a seaside airshow crossed with a country fayre with market traders, classic and custom cars, tractors and all sorts of other attractions dotted around the town and local streets. 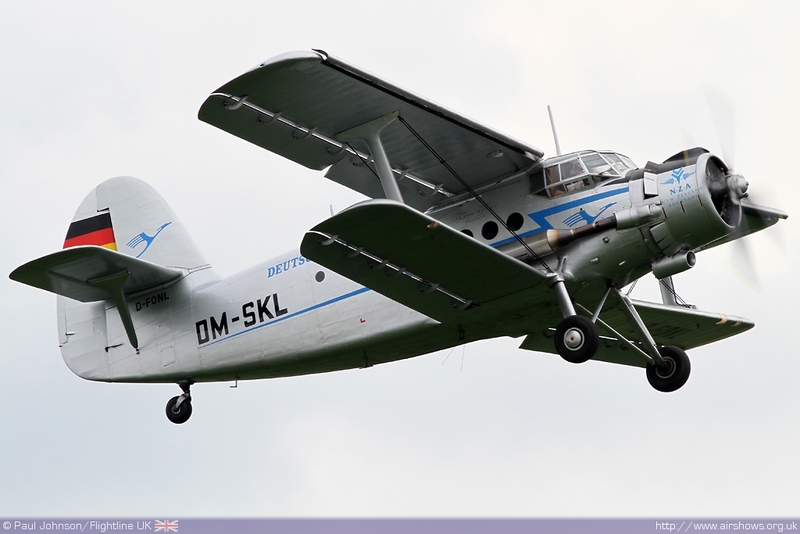 The locals have ample opportunity to get in to the air too with pleasure flights being offered in helicopters as well as an Antonov An-2 from Classic Wings in Germany which also displayed later in the afternoon. 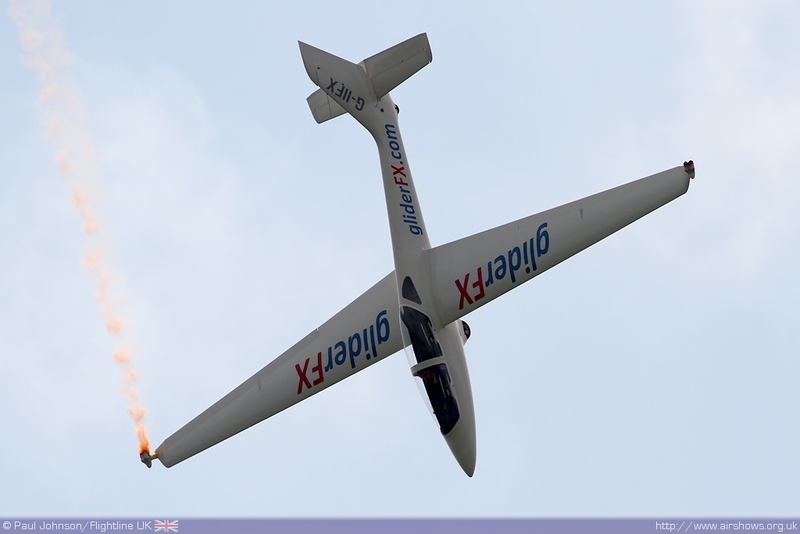 Fortunately, after rather a damp and grey airshow in 2010, Volkel enjoyed good weather all day with early clouds clearing to wonderful clear blue skies for the latter half of the flying displays. 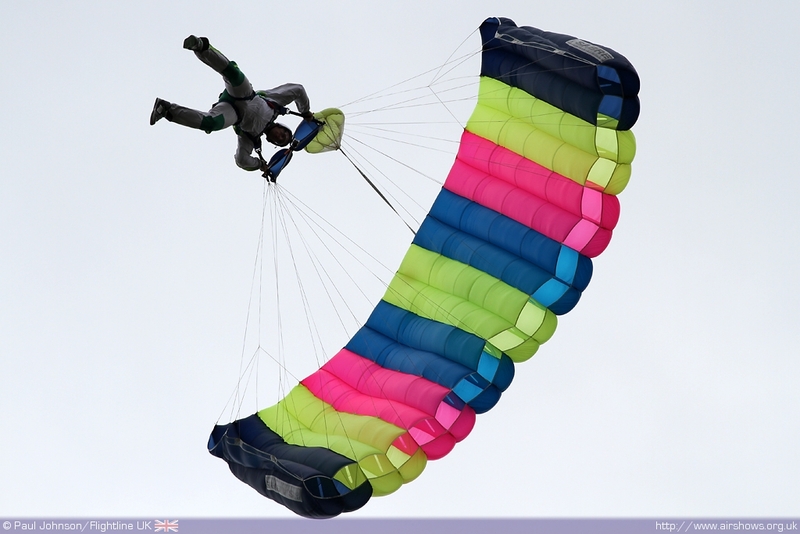 The flying display was opened by the traditional parachuting displays. 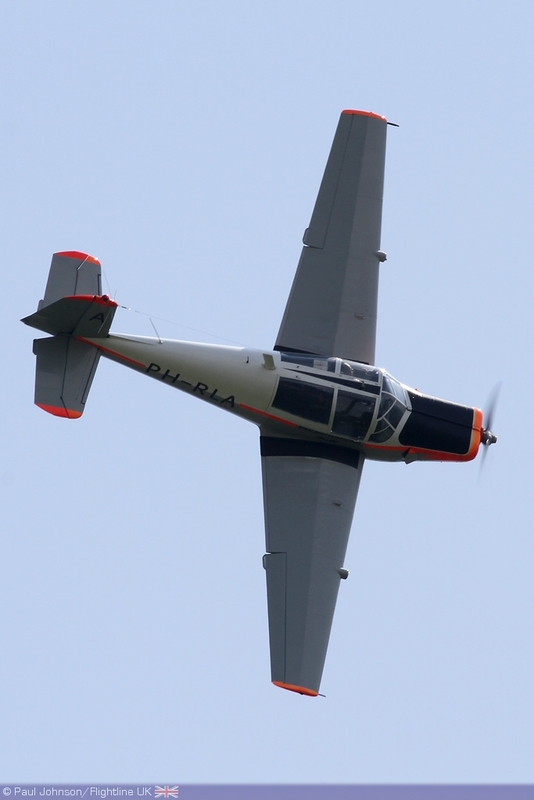 In all there were six jumps from the parachutists throughout the flying display all from the impressive Pilatus Porter. 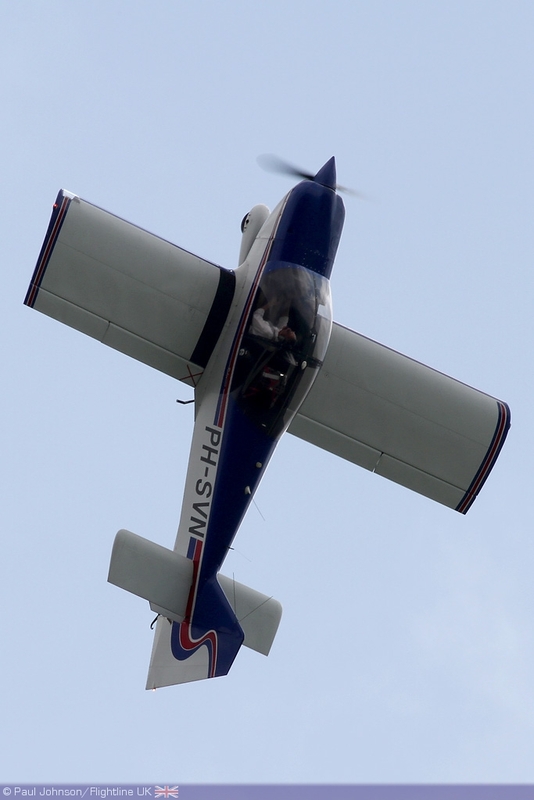 Following on from the jumpers was the GliderFX's Piper PA25 Pawnee flown by Paul Moslin towing a banner welcoming the crowds to the show. 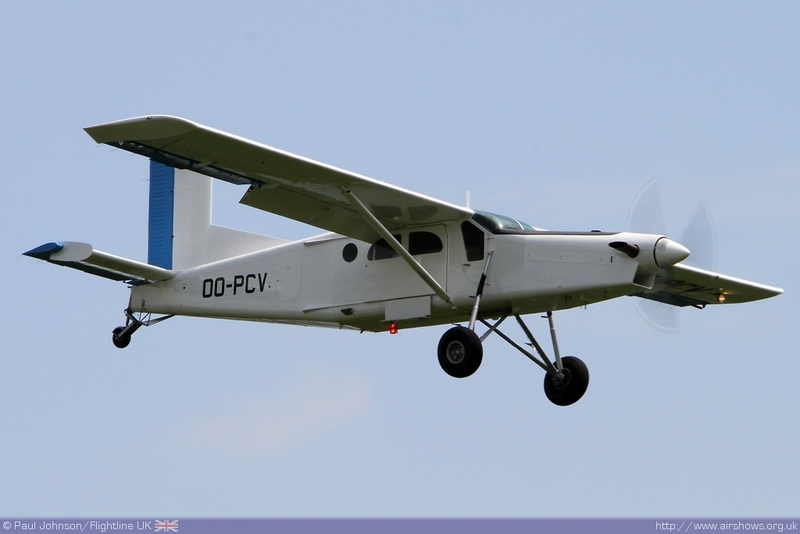 Over the winter, the Pawnee has been modified with banner towing kit and it is an unusual aircraft for towing banners which is usually the preserve of Piper Super Cubs and alike. 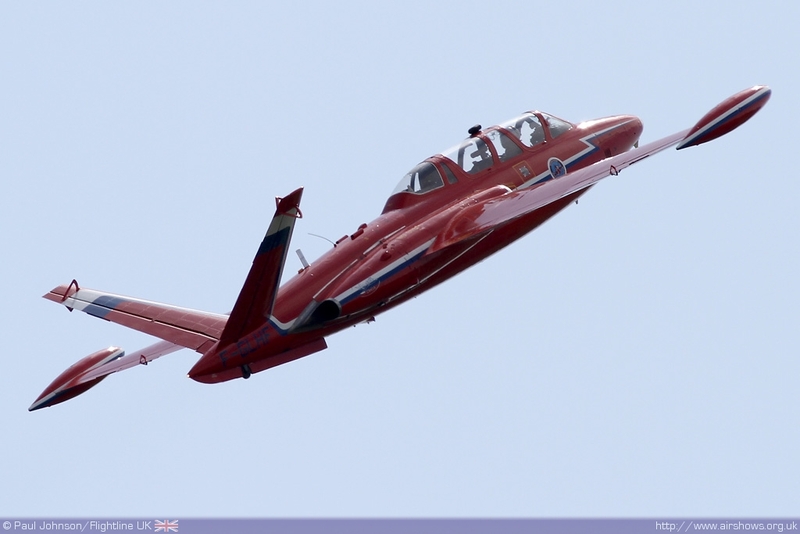 Staying with the UK theme, the first full aircraft display was Mark Jefferies in his stunning Extra 330SC aircraft. Mark demonstrated all sorts of stomach-churning tumbles with some very effective use of an impressive smoke system installed on his Extra. 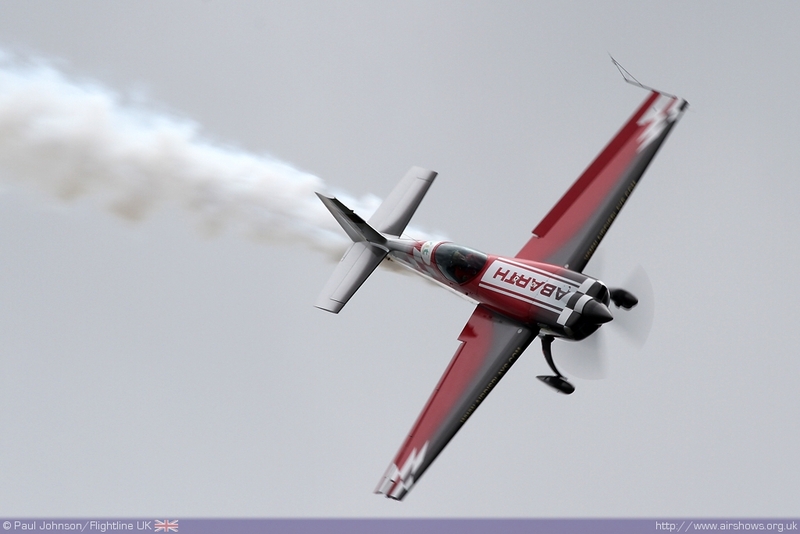 Mark was first in a series of aerobatic solos. 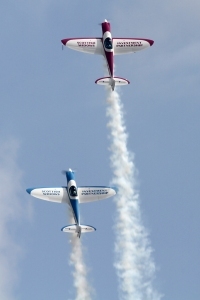 Eric Vazeille displayed the CAP232 that took him to bronze in the World Aerobatics Championships Freestyle competition in 2009 while local hero and Red Bull Air Race legend Frank Versteegh demonstrated how an aircraft is controlled in his Extra 300L before a brief series of aerobatic figures. 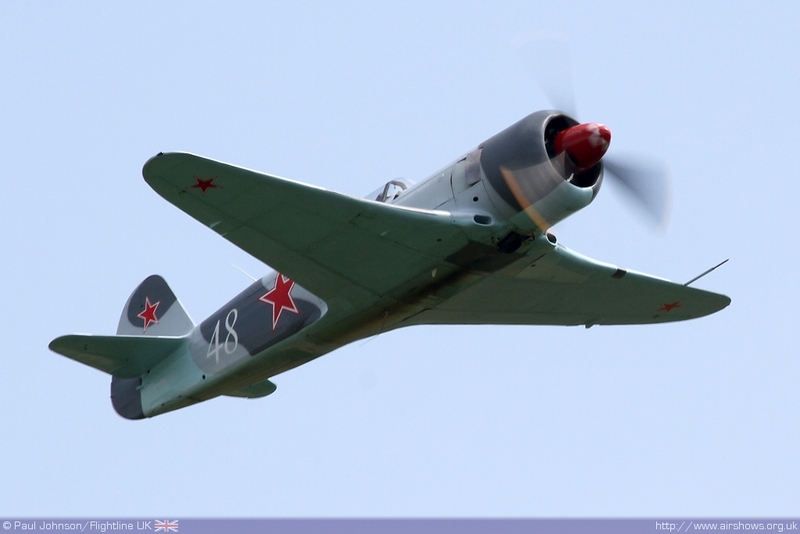 Volkel is very near to Germany, and it attracted a number of very unusual aircraft from that country. 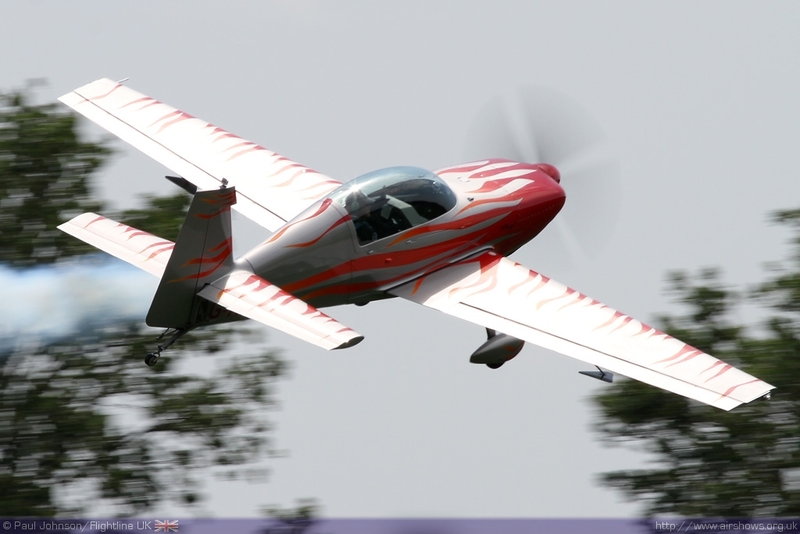 First of these to appear was a Gyro Flug SC-10 Speed Canard. 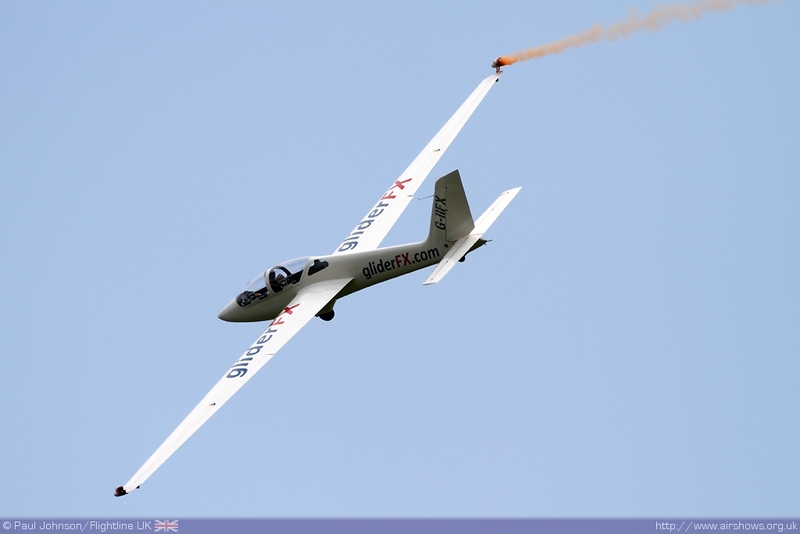 Looking very much like the popular Rutan VariEze aircraft from the US, the Speed Canard was certainly an eye-catching aircraft in the air. 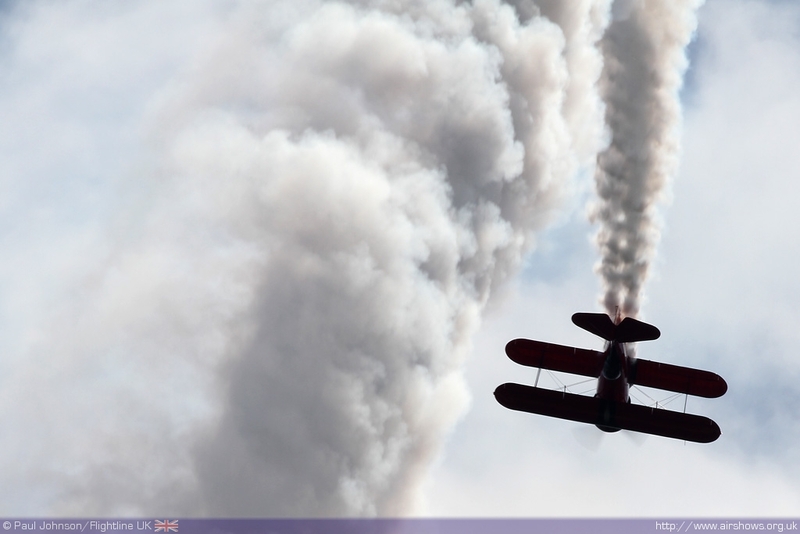 Joining the Speed Canard was a stunning looking aircraft, the Pitts Samson II flown by Uwe Schlätker. 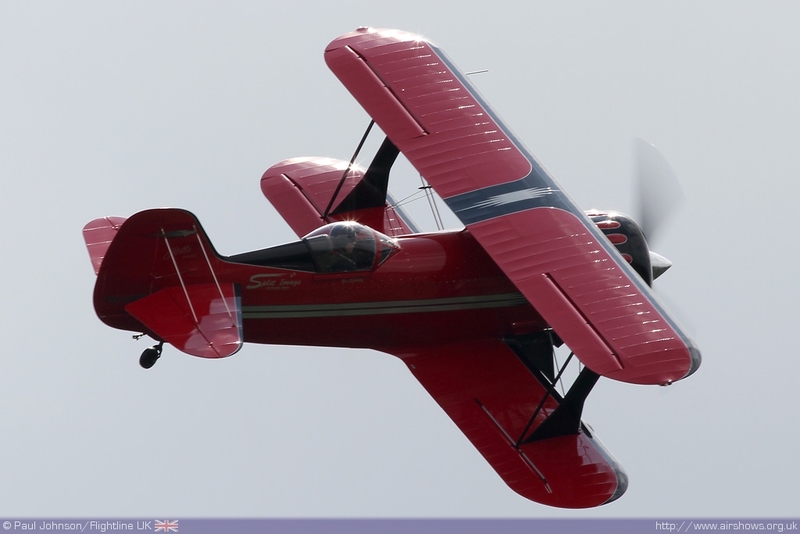 The Pitts Samson is a highly modified Pitts Special inspired aircraft powered by the legendary Pratt & Whitney 985 radial engine more commonly found on bigger aircraft like the Boeing Stearman and Beech Staggerwing. The effect on the Pitts is awesome giving the Samson a great power to weight ratio and some amazing smoke trails! 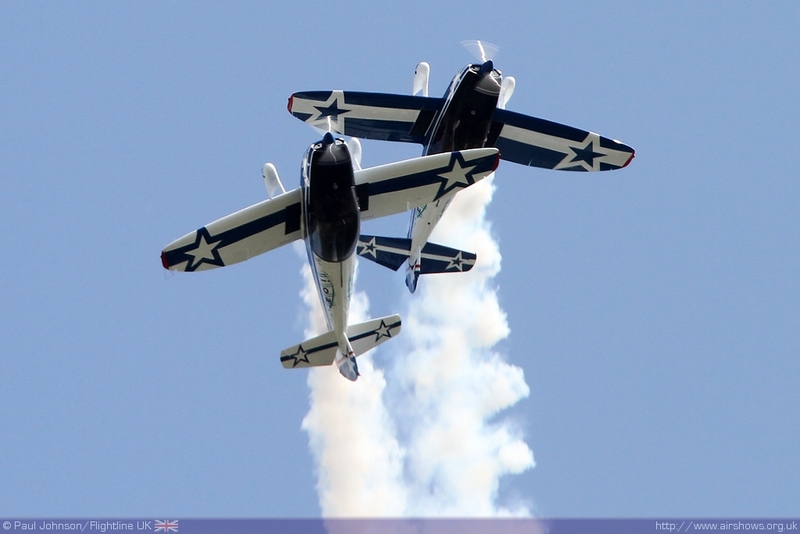 As well as solo acts, Volkel also welcomed some quirky formation acts. The Seagull Formation flies the Piaggio P149 trainers that at one point formed the backbone of Luftwaffe training during the Cold War. 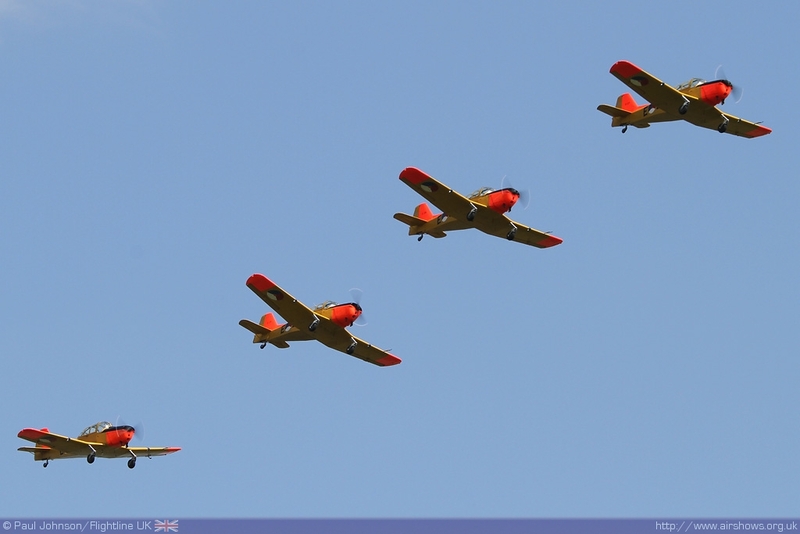 While the team is non-aerobatic that do fill the skies with their five aircraft, one wearing bright target towing colours while the others wear their standard Luftwaffe camouflage. 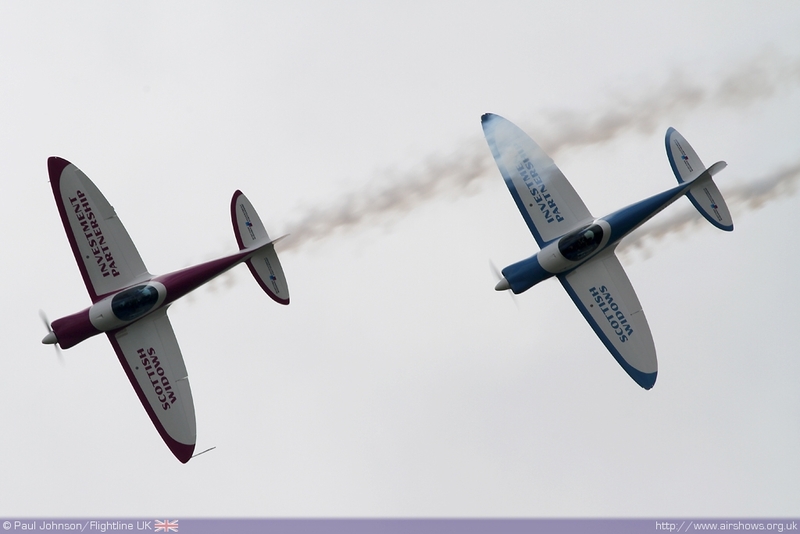 Another large, but non-aerobatic formation were the Victor Romeo team from Rotterdam Flying Club. 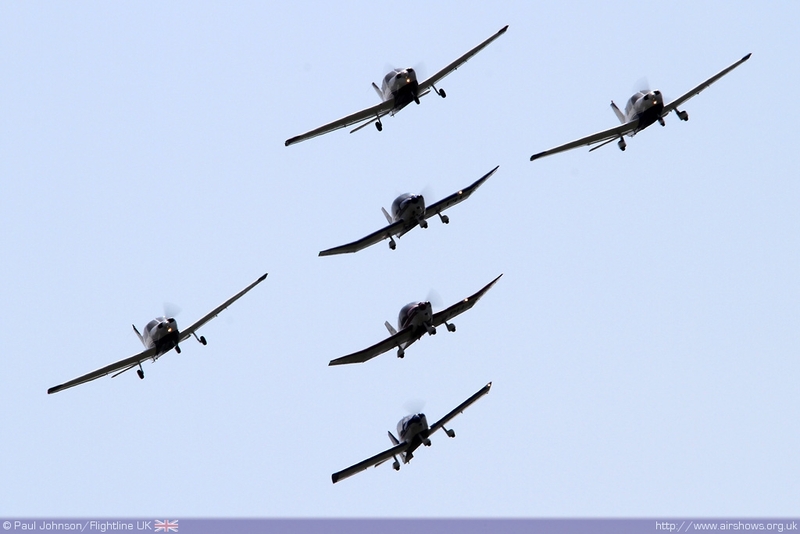 This formation consisting of Piper Arrows and Robins of various marks flew some impressive large formations. 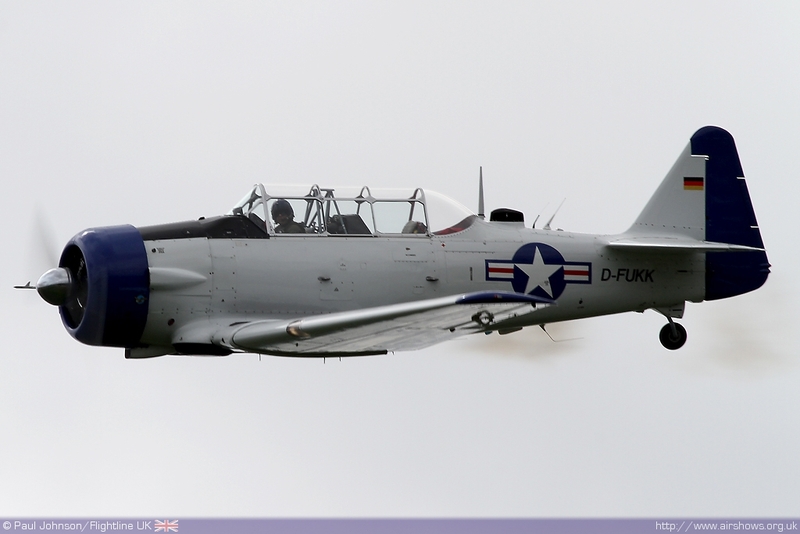 Part of the formation was a Robin 2160 which also performed some solo aerobatic in a separate slot. The last of the big formations was the Fokker Four. 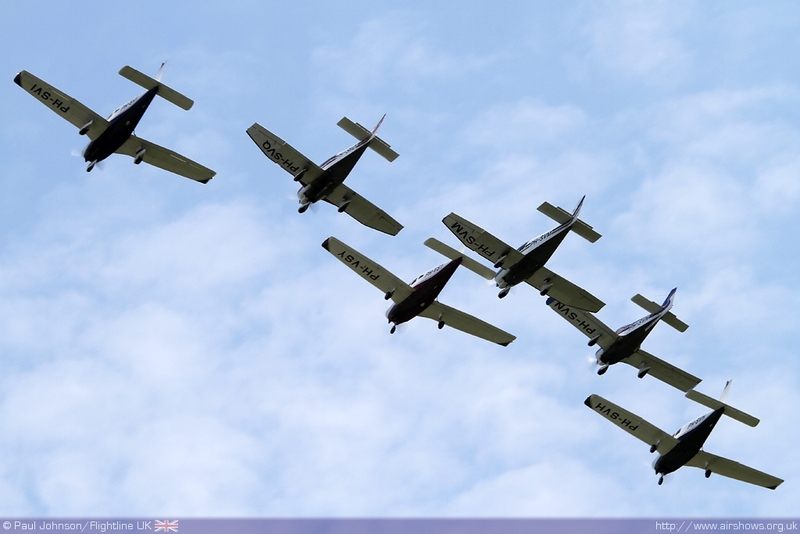 Made up of four Fokker S.11 Instructors, this team performed synchronised aerobatics as well as formation passes in these colourful ex-Netherlands Air Force trainers. 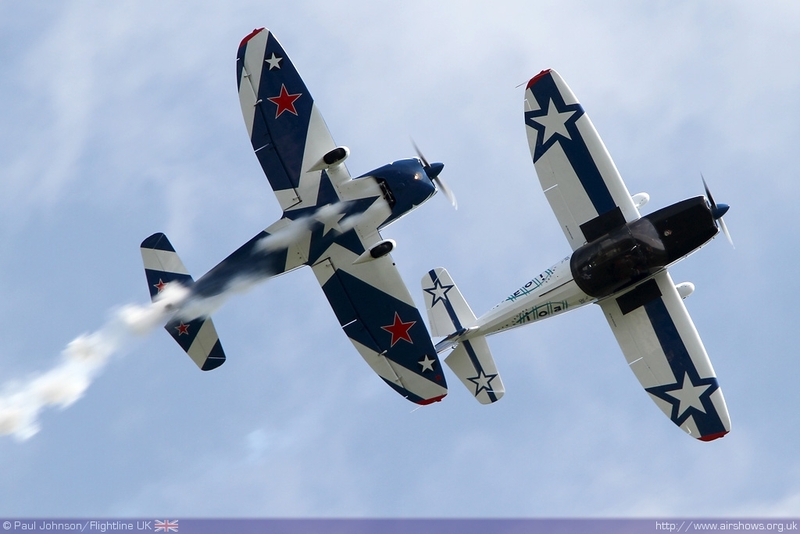 Further ex-military trainers were provided by a German based T-6 Texan, Dutch SAAB Safir and the Dutch Fouga Magister. 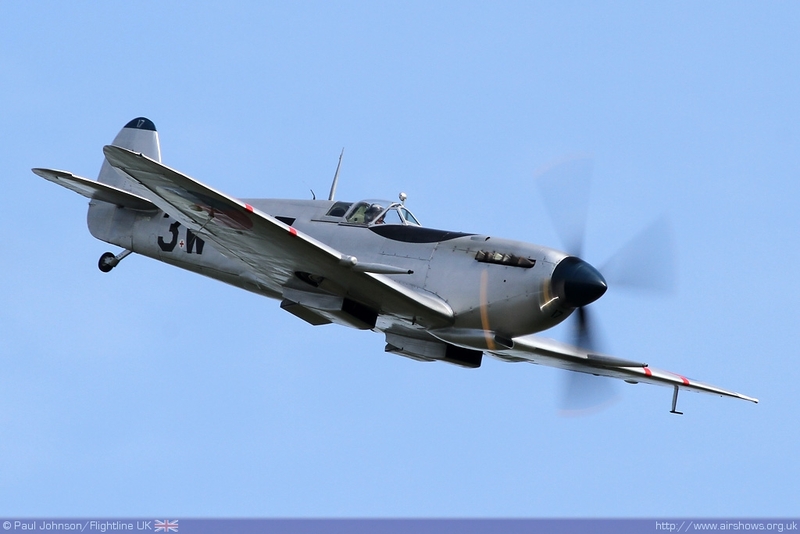 The latter provided the only classic jet flying of the afternoon with a beautifully presented display. 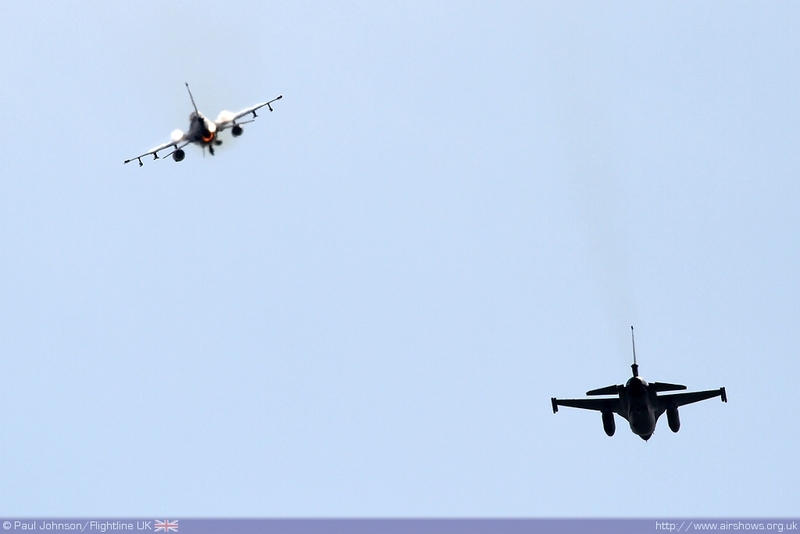 There were some very pleasing civilian display teams from across Europe. 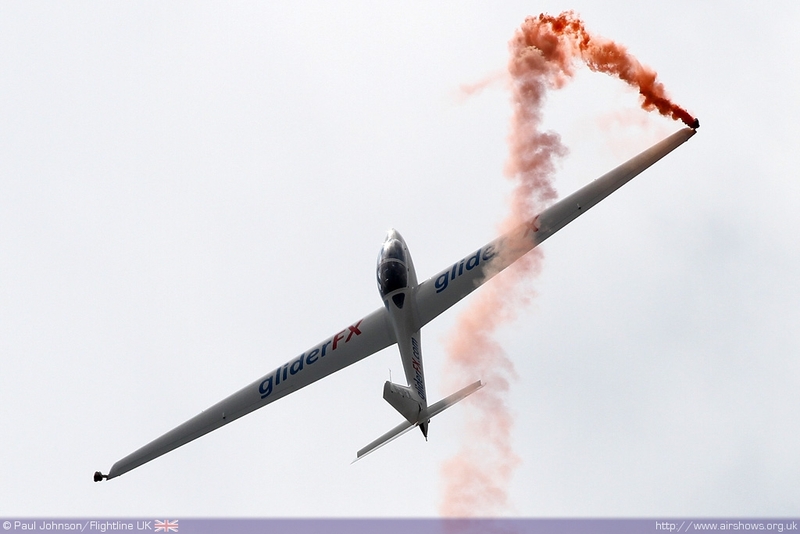 Guy Westgate flew his stunning "GliderFX" aerobatics routine in his new MDM-1 Fox glider both on-tow behind the Pawnee flown by Ian Gallacher and off-tow. Guy also performed with Pete Wells in the SWIP Team's first appearance overseas with their delightful Silence Twisters. 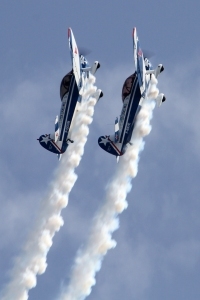 Returning again to Volkel after a superb display in 2010 was the Captens Display Team. 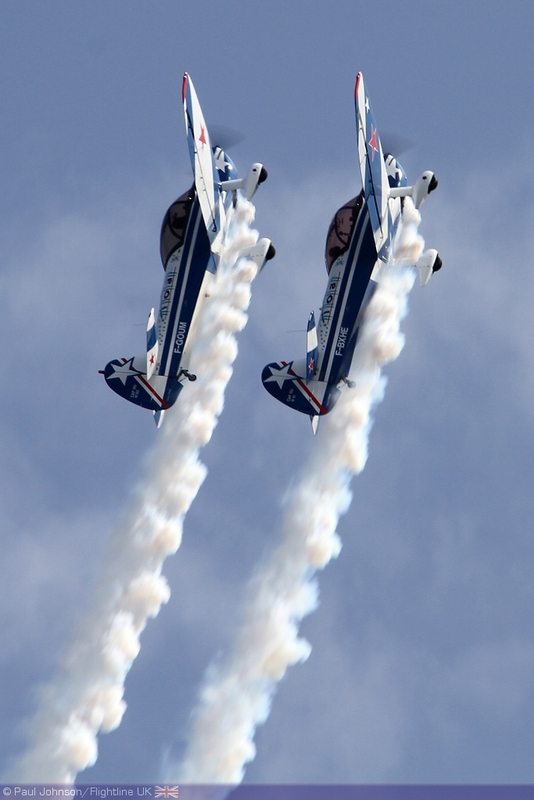 Marianne Maire-Shaw and Adam Shaw fly a beautiful display choreographed to music in two beautfully present CAP10 aerobatic training aircraft. 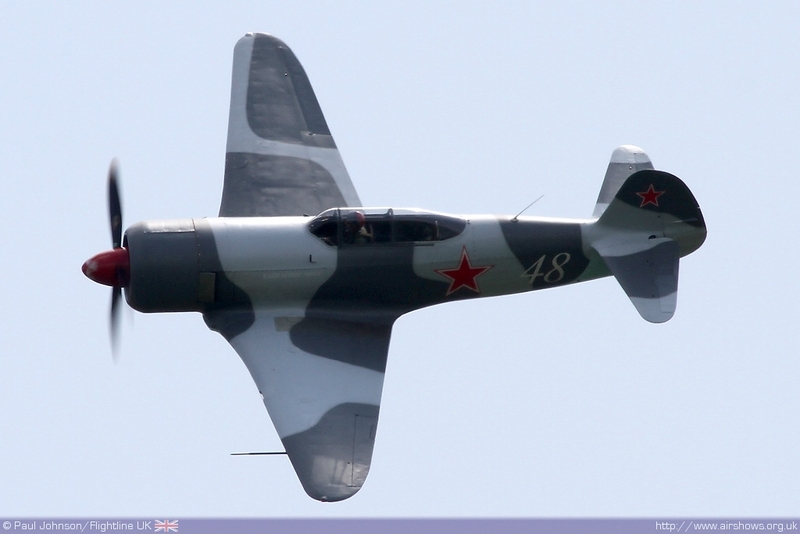 It was good to see a number of warbirds taking part in the show. There were powerful displays from R v.d. 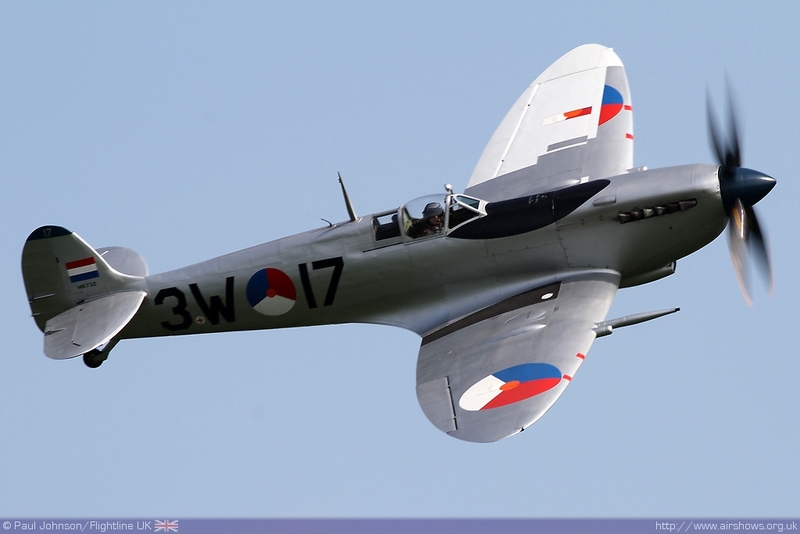 Graaf's Yakovlev Yak-3 and the Dutch Historic Flight's P-51D Mustang "Damn Yankee" but the highlight of the warbirds was the Royal Netherlands Air Force's Spitfire IX. The Spitfire put on a really well presented display showing the aircraft off brilliantly to the crowds in the late afternoon light. 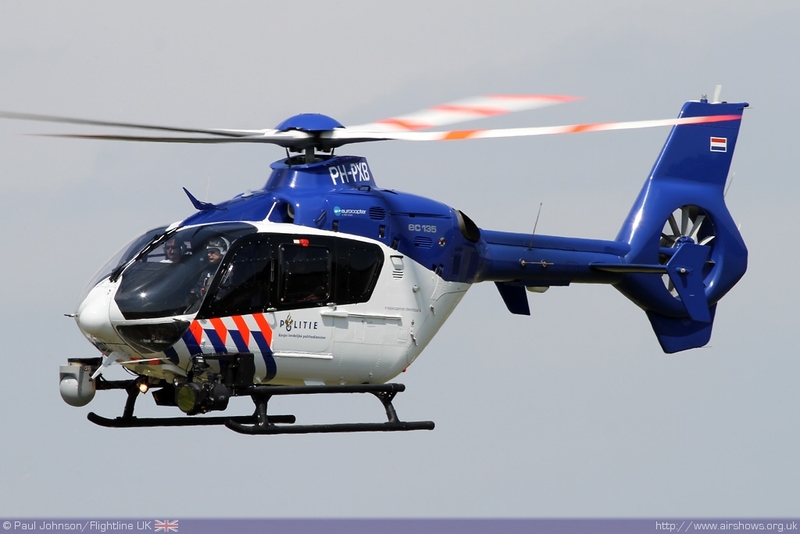 Despite drastic defence cuts to all the Netherlands armed forces, it was really great to see such a strong showing from the Royal Netherlands Air Force. 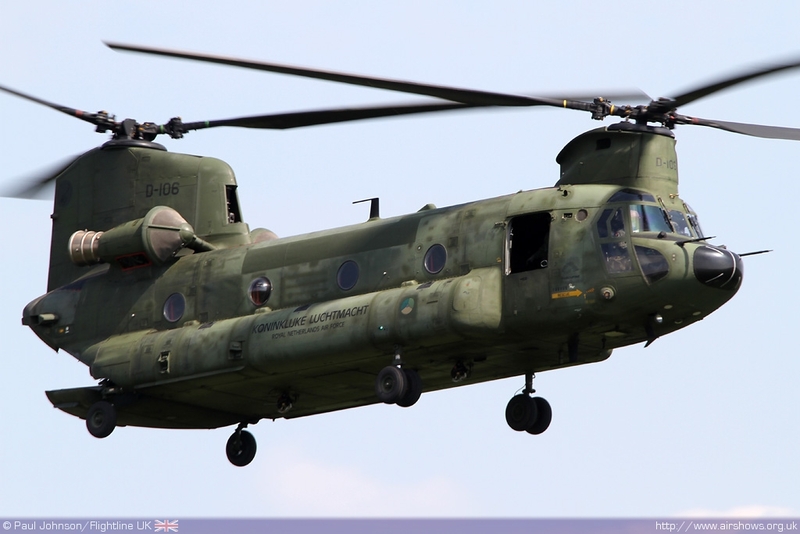 A rarely seen Boeing CH-47D Chinook was on static display throughout the day before making some spirited flypasts on departure towards the end of the show. 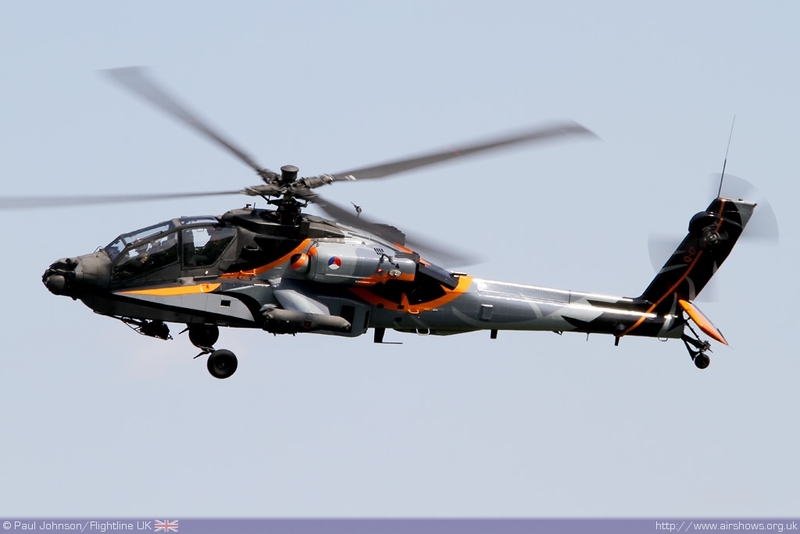 But the absolute show highlight was the solo AH-64D Apache Demonstration. 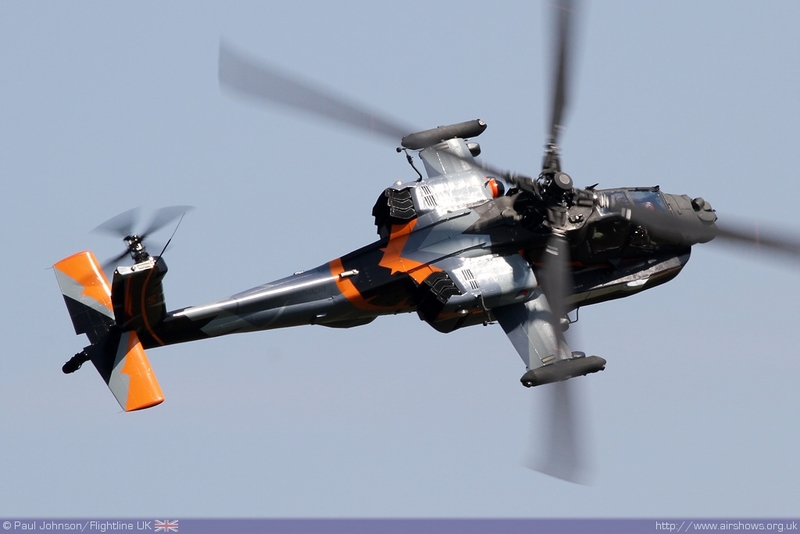 For 2011 the display aircraft is received an absolutely stunning and patriotic colour scheme of black, silver and orange. 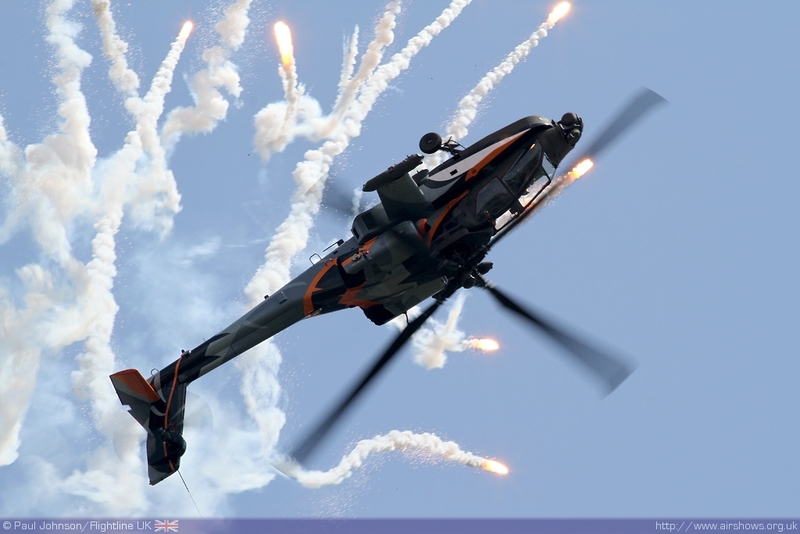 Its display is as jaw-dropping as ever with loops and rolls punctuated by enthusiastic use of flares, particularly on the crowd-rear arrival! 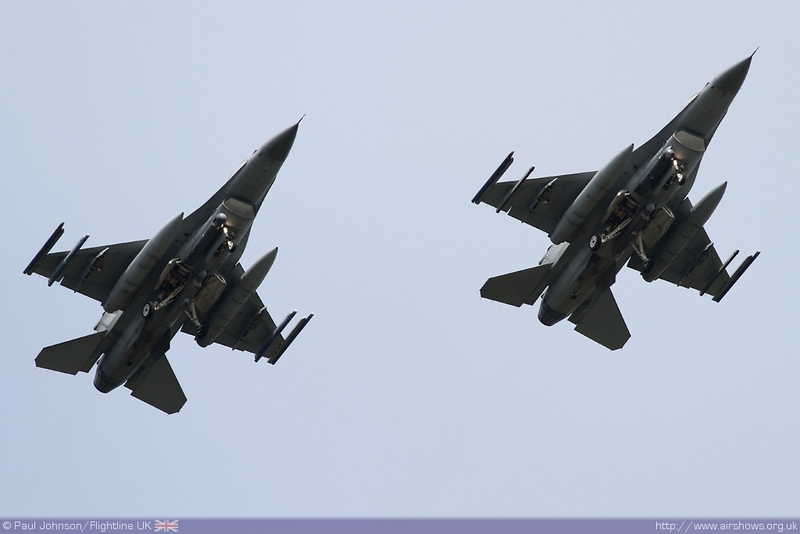 The show was closed by the traditional F-16 Fighting Falcon flypasts from Volkel. 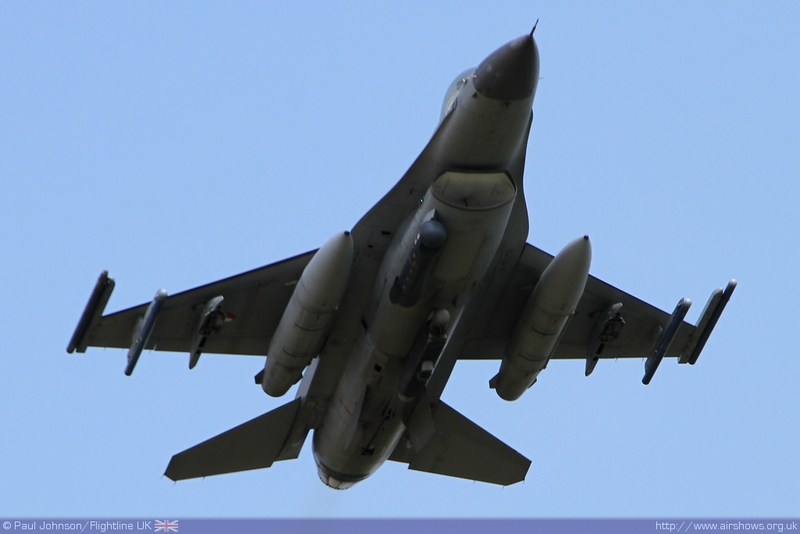 It is a time of change at Volkel which will lose one of its F-16 squadrons this year though they will remain a regular sight in the skies. 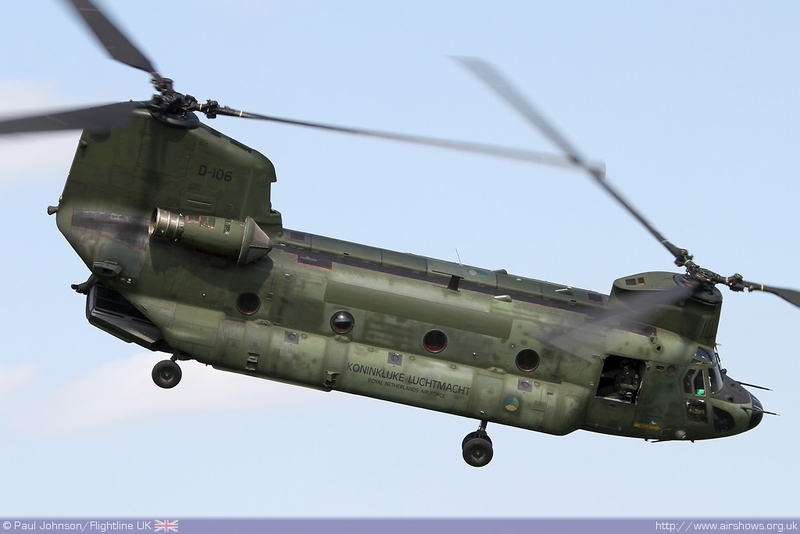 It was therefore perhaps a more poignant event than usual with four aircraft taking part. 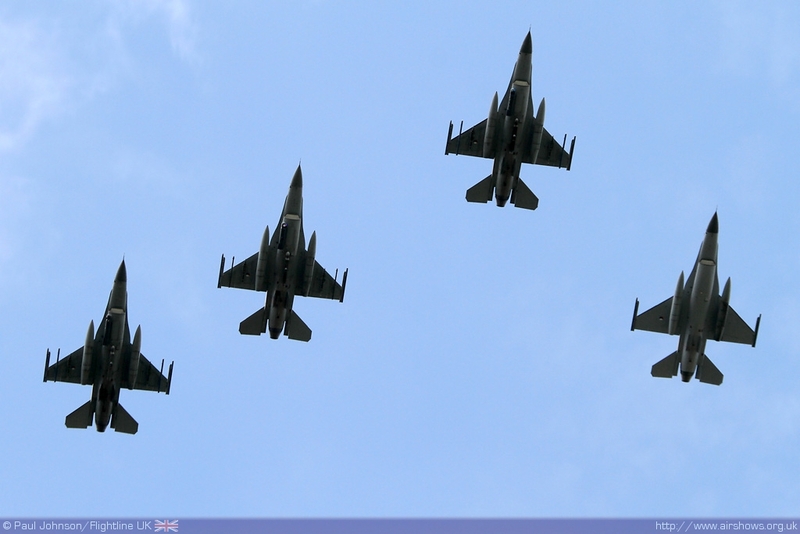 The aircraft made a number of approaches, first in finger four formation before splitting into pairs for low and high speed runs bring the day to an end. Volkel was once again an entertaining display, full of some great flying from displays old and new, and some unfamiliar.